Hewitt won Wimbledon in 2002 but had a poor record against Federer until his Gerry Weber victory. (CNN) -- Lleyton Hewitt defeated Roger Federer in the final of the Gerry Weber Open, ending the world number two's 29-match unbeaten streak at the grass-court tournament. 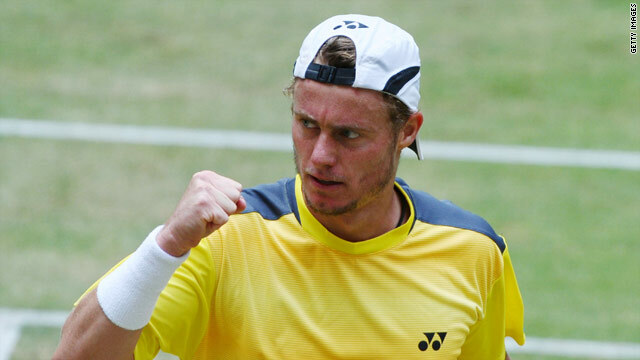 Australia's Hewitt, who had lost his last 15 meetings with the Swiss, rallied from a set behind to win 3-6 7-6 6-4 in Halle, Germany. "It's fantastic," Hewitt told the official ATP Tour Web site. "Roger's a hell of an opponent; his grass-court record speaks for itself. "Any time you play Roger on a grass court you know you're in for a hell of a battle and I was lucky to get out of today's match. "It's fantastic for me; I'm getting towards the end of my career and had couple of surgeries, to know I can still compete at this level. I'm thrilled to be here and to have won another title." The defeat is a setback in Federer's preparations for Wimbledon, where he will be aiming for a record-tying seventh title later this month. Federer had won five straight Halle titles from 2004 to 2008 before opting to miss the event last year. Since 2003, his only previous defeat on grass had come in the 2008 Wimbledon final against Rafael Nadal. Meanwhile, Sam Querrey defeated Mardy Fish 7-6 7-5 in an all-American final at the Aegon Championships at Queens Club, London. Querrey, 22, picked up his third title of the year, after wins on clay in Belgrade and indoors in Memphis.